Radiohead has decided to follow Prince’s lead by trying a new distribution model for their music. 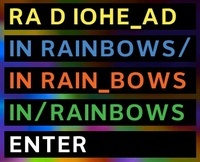 The band announced that the new album, In Rainbows, will only be available via Radiohead.com. And the consumer picks the price for the digital download. Time made it sound like “free” was even an option, though another source explains that there is a minimum charge of 1 pence plus a 45 pence credit card processing fee. In dollars, about $0.94, and that’s for the entire album. The Wall Street Journal calls the move something that will “challenge numerous aspects of established music-industry business models.” Sure, I guess. But music industry business models seem to be challenged in so many ways as it is. I don’t think Radiohead’s move is that significant. And it’s going to be difficult to measure this move in hopes of labeling it a success or failure. What is success in this case? Number of albums “sold?” Dollar amount of sales? A decent price per unit? Break even point surpassed? Power to the consumer? Another issue: moves like this only get buzz if done by artists who are famous in the first place. So how will this become relevant as a business model for the majority of artists with no money to handle the upfront costs and no fan base to milk via concerts?